The Skinny: Amazingly boring gambling film starring one of the princes of the genre, Andy Lau. Directed by the genre's evil stepfather, Wong Jing. It’s about that time: another gambling film! Andy Lau is the gambling hero of the film’s title, only this isn’t his character from the God of Gamblers movies. He plays King, a “sharper” who uses technology and sleight-of-hand to win at gambling. After being jailed for the accidental murder of evil mobster Bad Temper (Ben Ng), he returns to the world in search of his missing wife (Angie Cheung) and his son, who he’s never seen. Aiding him in his return to society is Skinny Dragon (TV star Nick Cheung), a wacky triad who wants to be King’s apprentice. King also becomes involved with Skinny Dragon’s sister, a PR-girl named Ching (Athena Chu). Ching resists King's considerable charisma at first. But hey, this is Andy Lau so eventually Ching comes around right in time for the bad guys to make an appearance. The main heavy is Handsome (Waise Lee), brother of Bad Temper, who wants King to help him swindle the most renowned sharper around, Macau Mon (Jack Gao). This involves poison, card trickery, and faked satellite coverage of the World Cup. A gambling movie should be a lark, shouldn't it? Well, somebody should have told that to Wong Jing. Not even the combined efforts of Andy Lau, Nick Cheung, and Athena Chu could save Wong's 1998 film The Conman from the depths of sheer tedium. With all that star wattage, it's a shame to find such enormous potential squandered so haphazardly. 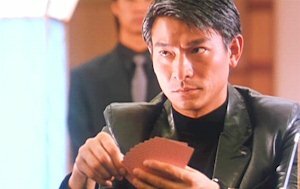 The film starts out promisingly enough with HK superstar Andy Lau introduced as the suave card sharper King, an unrepentant prick who cares more about the art of conning people than the well-being of his own pregnant wife (Angie Cheung). Caught red-handed scamming the aptly named Bad Temper (Ben Ng), King gets embroiled in a violent melee that results in Mr. Temper's departure from the land of the living. Taking the rap for the mobster's death, a prematurely graying King is released five (!) years later. Once out, he searches madly for his departed wife and son, hoping to make things right once more. Apparently, King's time on the inside changed more than his hair color; the guy grew a conscience. After that, a wannabe God of Gamblers named Skinny Dragon (Nick Cheung) tries to help King readjust to the outside world, as does Dragon's comely PR-girl sister Ching (the lovely Athena Chu). Somewhere in between Nick Cheung's mugging there's a search for King's family, a subplot involving Ching's gigolo boyfriend, and an emerging battle of wits with Handsome (Waise Lee). Handsome is Bad Temper's cueball sibling, who wants to join forces with King in order to steal from the world's greatest card player, the legendary Macau Mon (Jack Gao). Of course, this being a Wong Jing film, the denouement involves faked World Cup coverage, unnecessary commercial parodies, and a badly-wigged Wong Jing. All the ingredients of a classic ending, no? Yeah, I didn't think so either. In the end, The Conman looks good and has just enough going on to hold your attention, but ultimately it's a forgettable film. Andy Lau plays it cool, but Nick Cheung tries too hard in what should have been a funnier role. To her credit, Athena Chu remains fantastic to look at, but even her beauty can't make this movie rise above the scrap heap of HK gambling flicks. The film's desire to be all things to all people sometimes works against it. For example, the contrived melodrama involving King's crippled son Diamond King (*sniff*) is probably the film's Achilles heel. The music swells so quickly during a so-called touching moment between father and son that it's more likely to induce giggles than tears.